C T R Stables LLC. 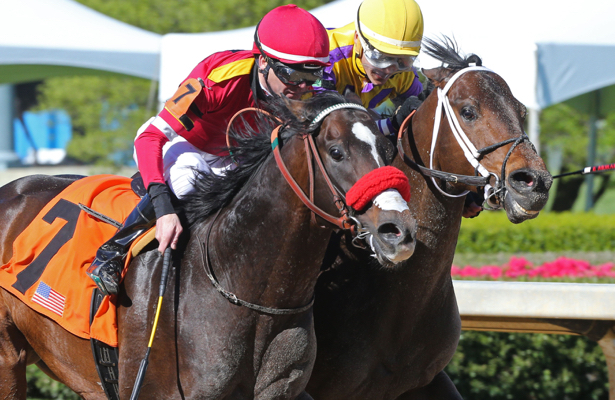 and Steven Keh’s Fight On, a 10-1outsider at Oaklawn Park, lived up to his name with a hard fought victory by a nose over fellow longshot Casino Star in Sunday’s $150,000 Fifth Season Stakes. He completed the 1 1/16-mile race in 1:44 3/5 over a good track. “Oh, man, what a ride,” trainer Doug O’Neill said by phone from his California base. “I had talked to Tyler Baze earlier today and just reminded him of how I think he fits that horse so well because that horse, wherever you think you need to move, you’ve got to move a little bit sooner because he’s kind of a grinder. Fight On improved his record to 4-3-2 from 17 starts and has now earned $310,411. The Into Mischief colt returned $22.00, $11.60 and $9.00. O'Neill said Fight On will be considered for the $250,000 Oaklawn Mile May 3.